Yesterday, Kotaku reported on Nintendo and 54 software makers filing an injunction to stop the sales of the R4 and similar devices in Japan. For the uninitiated, the R4 allows you to download DS games online and play them on your DS. Yes, DS piracy. And now said piracy is threatened! So what does that mean? R4 sales are through the roof. Hell, even I bought one yesterday. 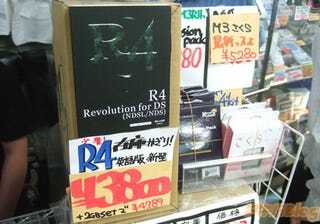 The R4 is sold all over the place in Akihabara, the nerd district of Tokyo, and the employees at stores there have already noticed an uptick in sales.